People land on your website, hang around for a couple of seconds and then leave without visiting other pages. Sounds like a familiar issue? You work really hard in building the content and designing your website, but if those aspects don’t drive visitor engagement, it will be of no use. You need to work more on your customer engagement strategies if the users are not pulled in or compelled to take any action. Visitor engagement on your website provides the chance to collect data about the visitors and prospect new customers. You can easily use these data for making strategic business decisions and improve parts of your website that influences your customer’s online journey. What’s working and what’s not, what are those aspects of your website that are attracting the visitors, which factors making them leave your website, all these are very tough to understand. To provide you some guidance, here, let’s discuss about some easy ways that will help to improve your website engagement rate. If you are looking to engage with your customers, acquire new ones and decrease the bounce rate of your website, then first start changing your content. Your website content may range from blog posts, testimonials, product description, and videos to case studies, FAQs and other old content. You can add live chat software on the website to proactively engage with the customers. It offers quick response in real-time and higher customer satisfaction which can generate more conversions. The website visitors’ online experience increases exponentially when through live chat they quickly get answers to all their queries instead of making a call and wait being on hold for speaking to a customer support agent. With the user data provided by live chat, you not only know how many chats you receive per day or which chat agent chatted with how many customers but it also provides deeper insights like it allows you to know the demographics, geographical location, past visits, behaviour of the visitor on your website. All this info will help to improve the overall user experience, make better decisions for business growth and increase customer satisfaction. Allowing the visitors to easily find out what they are looking for on your website is the easiest way to keep them engaged. While designing your website navigation bar, keep one thing in mind: it should be easy and simple. People are impatient and they are not going stay on a website for a long time if they don’t find things easily. The navigation bar should be consistent throughout the website and each section should be titled properly in an obvious manner. Make your website mobile optimized because recent studies show that, nearly 1.2 billion people are now accessing the web from their mobile devices. Apart from that, as per Google’s latest algorithm update, it enacted significant penalties for those websites who failed to meet the basic standards for mobile friendliness. So if your website is not mobile, responsive, then you are going to have a tough time in your business for sure. Your content which looks great on the desktop, may be unreadable on a mobile device. A visitor who is visiting your website from his smart phone, will not stay on your site if it does not open or work properly on his device. People hate to interact with a slow website, this is perhaps the reason why webpage speed is now an official google ranking factor. If you really want customers to engage then your web page loading process should be really fast and efficient. If the website takes too much time to load, then visitor engagement will suffer no matter how excellent the content is or how well structured the navigation might be. Allow the readers to share pages from your website on Twitter, Facebook, Google+ or other social media channels to ensure higher website engagement. Seeing others to like your page or tweet recommending your product or service will increase the trust level and they may want to give it a try. Social media not only encourages further sharing with a level of trust involved, but also helps to build a group of loyal users and long term readers. 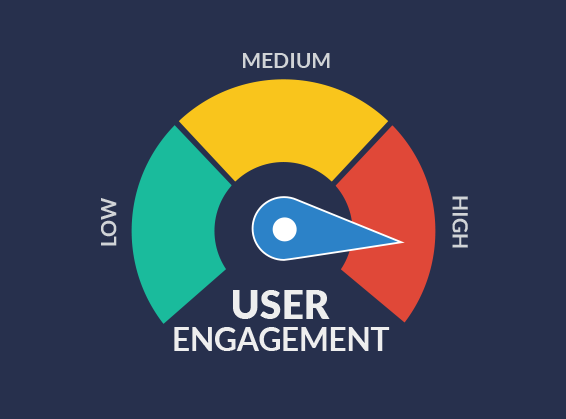 Here we have covered several areas that can increase the engagement rate on your website. Many of these ideas are very simple to apply, but often overlooked while making the customer engagement strategies. You should focus on how continuously you can improve user engagement on the website as it will help you to achieve the business objectives and serve a purpose to the company’s growth. Nice tips shared by you about How to increase the conversion and visitor engagement,Both are the important for our business.Visitor Engagement and conversion is necessary to increase eCommerce sales.This article has been helfpul and we will begin to exercise some of the ideas. Thanks Tomal for your appreciation. I have a website with continuous flow of news topics. I first tried posting only news content as there was plenty of new launches and phone related news, but it’s not rewarding for long term. Now those old news articles show up as related posts which offers no value.In this case, how do I boost user engagement. Any tips would be very helpful. Its a great idea and I want added another thing. Every website should be for a regional based. We can make it on global perspective and take those content which easier to understand for all. Thank you for sharing this concept. Thanks for advising some good ideas. Will try to implement and get the feedback. Never tried a live chat soft would love to get the idea and try it. But will live chat really work? Hello Akash. One way will be re sharing those old content on your social media channels like Facebook, Twitter, Google+ etc. This way the old content will be again viewed by the audience and increase your user engagement. I truly enjoyed the top quality info you present to your visitors. Will be back again frequently to check up on new posts. Great article! Looking forward to companies becoming more data-driven in 2016.